Michelle is one of the runners up from our last Chef Uniforms NRA Contest back in April, as well as a model chef. That made July’s Chef of the Month decision a very easy one! Below is a little biography, followed by our interview and a little something extra for our readers. Michelle grew up in Florida, and is a single mother of a beautiful daughter and handsome son. She is a sister to two older brothers and two younger brothers. Her passion for cooking began as a child, spending time in the kitchen watching her mother and grandmother. While her brothers were watching cartoons, she was watching the greats: Julia Child, Graham Kerr, and let’s not forget Justin Wilson. At the age of 16, Michelle was lucky enough to be taught the art of Real Italian cooking by the famous boxer, Jake LaMotta, also known as “The Raging Bull”. It was then that she learned that true Italians say “Gravy”, not “sauce”. Over the course of her life she has been in and out of the food industry working in restaurants and catering while working towards a degree in Design from Penn State University. 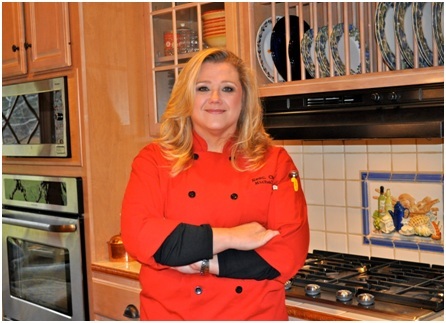 Prior to pursuing her career in culinary arts full time, she worked as a residential designer for 15+ years, still catering on the side, because of her love and passion for cooking. I have been cooking since I was 8 years old. I went to PSU and have a degree in Design and was a residential designer for 15 years. I did small catering jobs on the side, only because I love to cook. When the housing market took a bad hit I was pretty much out of a job, and so I decided to turn to my one true love to make a living and I have never been happier. Watch and ask questions to everyone you see cook, or who you know that cooks. Everyone has special techniques and short cuts they can share, some of the best cooks are those who have learned through life’s trial and errors. The only dumb questions are the ones that aren’t asked. Work in every aspect of the restaurant field; front and back of the house. You will have more knowledge and compassion for your fellow co-workers. This will help you become the very best Executive chef because you will know what everyone’s part is and what they go through to have a smoother-running operation in both the front and in the back of the house. When you want to buy local, a lot of the time it is just impossible. When you want fresh ingredients all the time – sometimes that just is not an option. Yes it has. Food venders have to charge more because they still have to transport the food from place to place, and that has to be passed down the line. I think people are coming around as to knowing that food really does taste better when it is not cooked to death. I love the cotton blend chef coat with a ¾ length sleeve. Oh yes most definitely. It helps in getting your juices flowing tasting other cuisine. Yes, and sometimes it also reassures me that what I am doing is the right thing. I make them for the employees and family and friends. They will be most honest with you because they want you to succeed. No, people are going to eat what appeals to them. Cook what you like and what you’re good at. Also check out what other restaurants in the area are serving and that too will help you. Follow your heart. Cook what you like and step out of your comfort zone often. 15. Would you please send us a recipe for our readers? Sprinkle the chicken with salt and pepper on both sides. In a large skillet over medium heat, warm oil and sauté chicken. Press on chicken occasionally with a slotted spatula. Cook for about 4 minutes per side or until the meat feels springy and is no longer pink inside. Transfer to a board; cover and keep warm. Discard the fat from the skillet. Since Michelle was so happy to participate with us and stood out in the competition, we decided to give her a $25 Chef Uniforms Gift Card! Congratulations, Michelle, and thank you for participating with us! ← Working on 4th of July? Try Some Easy, Yummy Treats! Thank you for this blog. 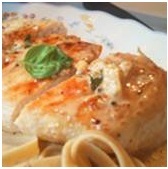 And definitely thanks for the recipe; I have been craving chicken, and this recipe really looks taste. I will most assuredly make it tomorrow.